WITH MOUNTAIN VISTAS AND SWEEPING VALLEYS STUDDED WITH QUAINT VILLAGES AND HISTORIC TOWNSHIPS, THE ALPINE VALLEYS OF NORTH EAST VICTORIA OFFER A MEMORABLE HOLIDAY DESTINATION. 3 Bells Alpine Cottage puts you only minutes away from the historic sites of Wandiligong, the vibrant township of Bright, and a range of scenic rural settings, snow fields and vineyards, making it the perfect base from which to explore the Victorian High Country. Wandiligong is a tranquil village with historic cottages and public buildings that remind us of a bygone mining past. Take a picturesque walk or bike ride along Morses Creek and explore “The Diggings,” cross the Chinese Swing Bridge, and try fresh apples from the Nightingale Bros Alpine orchard or take in a refreshment or meal at the Wandi Pub before taking a historic trip through the township. For more information on local activities visit: Travel Victoria and Bright Victoria. 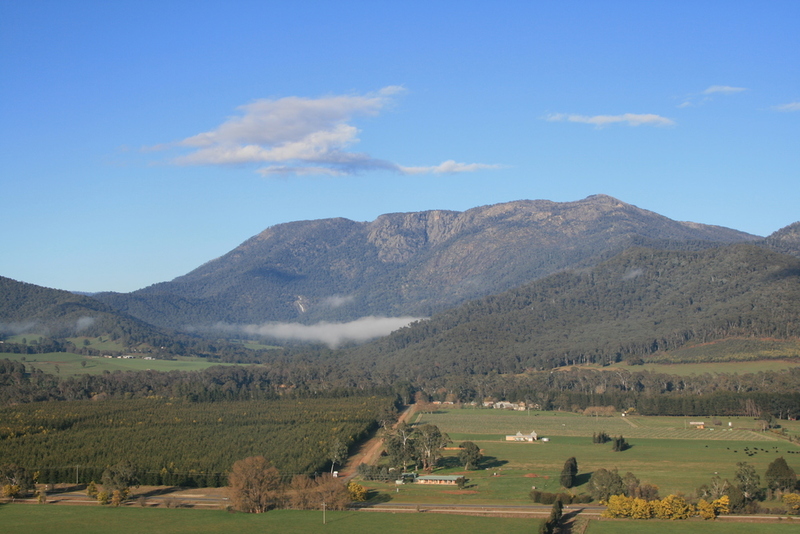 Porepunkah sits quietly at the base of Mount Buffalo National Park, and is a mere 10 minute drive from the heart of Bright. The petite village has a lot to offer with its historical mining past and the popular Rail Trail bike path. If you are were hoping to taste some local wines while in the region, Feathertop and Ringer Reef Wineries will provide a lovely drop or two in spectacular settings. The Alpine Valleys of North East Victoria offers a holiday destination for all seasons. With spectacular mountain scenery, the Murray to the Mountains Rail Trail, and renowned tourist drives including the Great Alpine Road and the High Plains Road linking the Ski Resorts of Mt Hotham and Falls Creek, providing challenging rides for motorcyclists and road cyclists alike. For more information on the Alpine Region and the Alpine Valleys visit: Travel Victoria and Victorias High Country. Bright is a year round holiday destination. The ever-changing landscape is one of beauty, making it a wonderful retreat regardless of season. Enjoy the numerous outdoor activities including bush walking, mountain bike riding and paragliding, or relax in one of the many cafes, quality restaurants or Bright Brewery, or shop for the perfect gift in the eclectic shopping precinct. Mount Buffalo National Park is the ideal escape for a picnic among the wildflowers and waterfalls, or a relaxing canoe ride on the Lake Catani. Be rewarded for scenic hikes with breathtaking panoramic views, or those less inclined can virtually drive to the spectacular gorge. Listen for the mimicked sounds of the lyrebird. For the more adventurous, there is abseiling, rock climbing and in the winter, cross country skiing. For more information on local activities visit: Visit Victoria and Parks Victoria.